The blast crater at Combat Outpost Inman. Photograph by Bill Roggio. MOSUL, IRAQ: Al Qaeda in Iraq pulled off a highly successful suicide truck bombing today in western Mosul. Thirteen Iraqi soldiers from the 1st Battalion, 3rd Brigade of the 2nd Iraqi Army division were killed and 42 were wounded after a suicide bomber drove a truck packed with explosives and detonated it in the center of Combat Outpost Inman. Three officers and nine enlisted soldiers were among those killed. Eight other soldiers suffered serious injuries and were evacuated to Forward Operating Marez for medical treatment. A dump truck packed with tons of explosives pulled off of the road that runs west to Tal Afar and ran right through the gate of Combat Outpost Inman at 6:55 AM local time. Iraqi soldiers fired at the truck, but the truck was armored to stop the bullets. An ambulance blocking the gate was pushed aside and turned over. The suicide bomber then drove into an area almost exactly between the three four-story apartment buildings that made up Combat Outpost Inman. The explosion was massive, leaving a crater 15 feet deep and approximately 25 feet wide. The explosive ordnance disposal unit estimated the truck was packed with anywhere from 5,000 to 10,000 pounds of explosives. 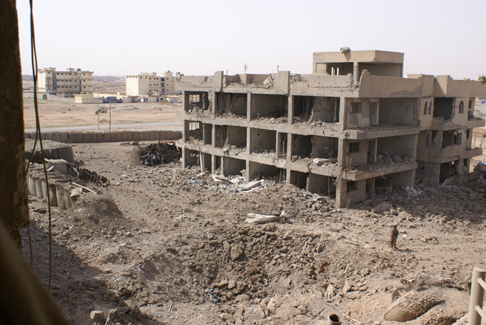 The blast destroyed the façades of the three buildings, including the building housing the battalion headquarters. Twelve of the Iraqi soldiers were killed on the spot, and the thirteenth later died of wounds in the hospital. Vehicles inside the outpost were destroyed or heavily damaged in the massive blast. Two ambulances were on fire, while a diesel fuel truck was twisted and lying on its side. Iraqi and US forces sent reinforcements to the scene to secure the area. US tanks, Bradleys, and armored Humvees surrounded the scene as Iraqi soldiers from the 2nd Brigade, 2nd Division entered the outpost to conduct recovery operations. Wounded soldiers were treated by Iraqi and US medics. Twenty-eight Iraqi soldiers were evacuated to the medical facility at Forward Operating Marez. Brigadier General Taha Askar also believed this attack was planned form the inside. “We believe this is some kind of plot,” Taha said while surveying the damage. But the battalion at Inman had some very real problems. There were only one or two soldiers guarding the gate instead of a larger size force that is required. Also, the road up to the gate was not staggered with barriers that force vehicles to move in a slow, zigzag fashion to proceed to the gate. This allowed the suicide bomber to hit the gate at full speed and bowl over the light ambulance blocking the gate. Combat Outpost Inman has had a short, ill-fated history. On Dec. 26, an Iraqi soldier, believed to be an insurgent infiltrator, killed a US Army captain and a sergeant as they worked to build the outpost. On March 20, Brigadier General Taha relieved Lieutenant Colonel Favil, the commander of the 1st Battalion and his executive officer from their leadership positions. The 1st battalion is responsible for securing the portion of the road to Tal Afar inside Mosul. Favil was absent from the unit after being arrested for shooting his brother, and his executive officer has not stepped up to lead the battalion. Their soldiers were failing to patrol the road, and insurgents were seeding the road with improvised explosive devices. Colonel Atyia, the new battalion commander, is set to take over command today. He has a major challenge ahead of him, said Meeker, as the morale of the battalion has taken a major hit and the inherent leadership problems will not be easily fixed. But some hope could be seen in the reaction on one of the seriously wounded soldiers. “We will fight the terrorists and we will defeat them,” the soldier told Taha from his hospital bed at Marez. Very sad news Bill. Many of the fiercest enemies of AQI were killed and wounded. Our hearts and prayers go out to the families of the soldiers of IA 1-3-2. AQI is sadly mistaken if they think that the morale of 1-3-2 will be hurt by this. The remaining soldiers of 1-3-2, and indeed 2nd IAD more generally, will come after them much more strongly than they can imagine. Is there, in your opinion, any connection to the recent removal of the commanding officer?